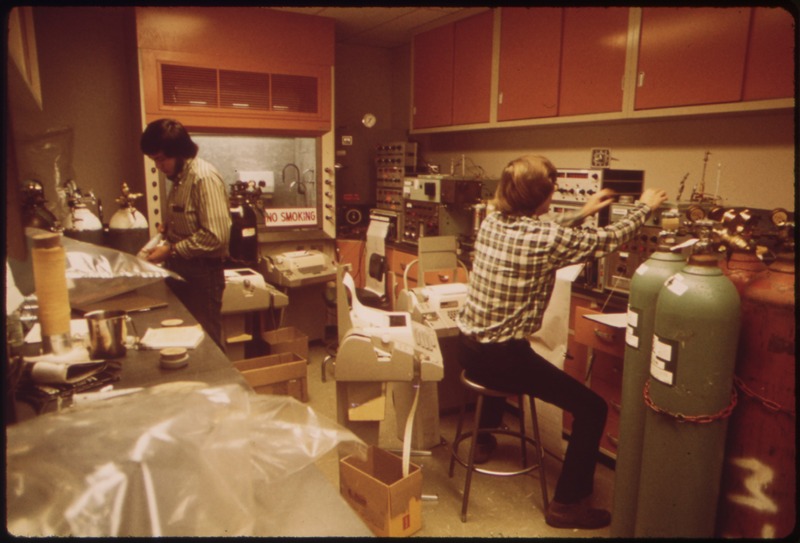 California Air Resources Board Laboratory, Los Angeles, 1973. A foundational premise of science and technology studies (STS) is that the things science takes as its objects of study–atoms, population density, methane–are not given in nature, but are produced through social, technical and institutional practices. The classical example is the double-slit experiment because it shows how apparatuses of observation do not merely uncover phenomena, but in fact produce the phenomena under study. The double-slit experiment is meant to determine whether light acts like a wave or a particle. Experimental results support both hypothesis, and these seemingly contradictory findings lead to the quantum, rather that classical, nature of light as a wave-particle duality. In short, the scientific device says light is both a wave and a particle, and so it is (for more, see this entry on relational quantum mechanics). Waste is also “made” by science, and not only in the literal sense. Anthropologist Mary Douglas famously states that “dirt is ‘matter out of place. '” Pollution and its material manifestation, dirt, are deeply social reactions to materials “likely to confuse or contradict cherished classifications.” In our society, we use science to determine classifications and boundaries that put materials in and out of place. For the most part, science puts trash, pollution, and other systematic externalities into place. An often overlooked argument made by Douglas is that garbage itself is not dirt: “So long as identity is absent, rubbish is not dangerous. It does not even create ambiguous perceptions since it clearly belongs in a defined place, a rubbish heap of one kind or another” (197). Technologies of externalization (outflow pipes), detection (air monitor sensors), containment (landfills), and extraction (mining) play central roles in creating and maintaining these heaps and boundaries that keep waste in place. In short, technocratic (technology + science + government) definitions designate when something is properly hazardous or not. When people outside of this system, such as citizen groups or “fence line communities” whose homes abut waste infrastructure, make claims that their air, soil, water, or bodies are contaminated with dirt–matter out of place– they are not granted the same privilege to determine whether this is, in fact, the case. Rather, they have to go though science to make their knowledge legitimate; this is one of the impetuses behind citizen science movements. Things are not officially out of place until science says so, and waste and pollution are increasingly scientific-technical objects, rather than entities ordinary people can recognize with authority. Thus, dirt is also about power, and the politics of knowledge. Their argument is two fold: 1) Plastics meet the scientific criteria for hazardous waste under the existing system; and 2) Plastics need to be included in this classification because they are currently out of place in terrestrial, freshwater and marine habitats. Yet, despite their call for reclassification from trash (in place) to dirt (out of place), plastics remain legislatively benign. This disagreement of classification using the tools of science further demonstrates that waste, pollution, and filth is not given in nature, but produced through complex socio-technical systems, and thus are open to debate. The status of plastics and their chemicals are in the midst of such a debate, and is my preferred case study for looking at how waste becomes. 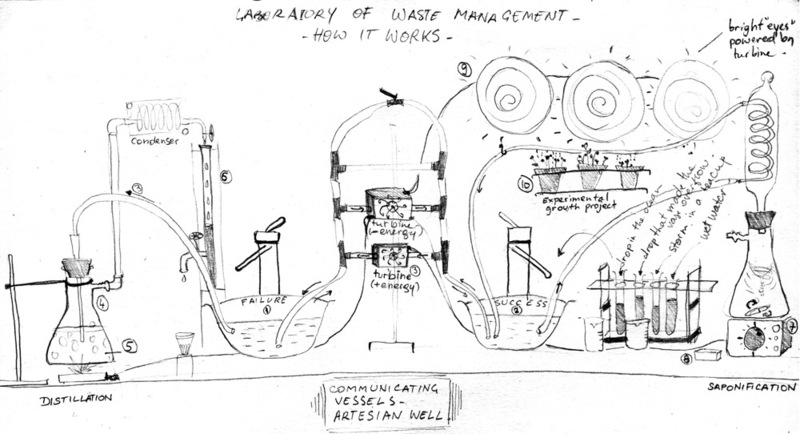 The becoming of waste is, in fact, what most people in the discard studies community research. Waste’s materials and flows do not merely move across spaces and scales, but (along with other actors) thoroughly constitute them. How does this happen? How is it maintained despite dissent and controversy? How is it interrupted? Returning to Douglas, dirt, waste, and “pollution ideas are the product of an ongoing political debate about the ideal society… [P]ollution beliefs uphold conceptual categories dividing the moral from the immoral and so sustain the vision of the good society.” Thus, debates about plastics, incinerators, and fence-line communities are not merely about wayward particles, but about “the vision of the good society.” Is it wrong for industry to use nature as a place to store hazardous waste, or is it “nature’s gift” to capital? Is the presence of plastic chemicals in human bodies acceptable if there is no is proof of harm? What is the fundamental ethical difference between politics of NIMBY (Not in My Backyard) and NOPE (Not on Planet Earth) and the society each describes? Zsuzsa Gille suggests, such as approach in turn reveals how “waste itself—its production, its consumption, its circulation, and metamorphosis—is constitutive of society.” Very often, science is used to weigh in on these social and moral decisions. Not only do many of the premises and modes of inquiry between discard studies and science and technology studies map onto one another, but what is most promising in STS, and in discard studies, is how we can use our theory to inform intervention. Because we recognize the confluence of forces within a wider system that make and maintain waste, we are trained to see the bigger, more complex picture. We are trained to focus on systemic rather than technical fixes to problems of waste and wasting. In this way, discard studies and STS are two disciplines that can take on the unique challenges presented by a post-natural anthropocene characterized by its ubiquitous, long-lived, world-changing wastes. Douglas, M. and A. B. Wildavsky (1982). Risk and Culture: An Essay on the Selection of Technical and Environmental Dangers. Berkeley, University of California Press. Douglas, M. (2003). Purity and danger: An analysis of concepts of pollution and taboo. Routledge. Gille, Z. (2010). Actor networks, modes of production, and waste regimes: reassembling the macro-social. Environment and planning. A, 42(5), 1049. Rochman, C. M., Browne, M. A., Halpern, B. S., Hentschel, B. T., Hoh, E., Karapanagioti, H. K., … & Thompson, R. C. (2013). Policy: Classify plastic waste as hazardous. Nature, 494(7436), 169-171. This entry was posted in Methods, science and scientists, Technology, Waste. Bookmark the permalink.